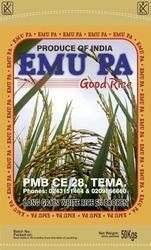 Exporter of a wide range of products which include rice seeds bag. We are the prominent manufacturer, supplier, and exporter of this domain engaged in offering a wide spectrum of Rice Seeds Bag. Rice seeds are prone to moisture and they require moisture proof and strongly laminated bag having extra thickness; we at our manufacturing unit adhere to industry standards and fabricate seeds bags for rice. This bag is made available in 1kg, 5kg, 10kg and 1 ton size in common, whereas clients can get the customized bag according to the requirements.